Until now, residency programs were time-based. This meant that as a resident, you spent one full year in each Postgraduate Year (PGY) before you could move up to the next level. Promotion was based on the successful completion of a year of learning comprised of thirteen equal rotation blocks, and this was the same for all residents. CBME reduces the emphasis of learning based on units of time and instead shifts the basis for promotion to the demonstration of competence. Our residency programs have been restructured into four new phases of learning, each with a different focus. In each phase, you’ll have to demonstrate that you’ve achieved competency in the clinical tasks and activities expected of you. You’ll be assessed using new concepts called entrustable professional activities and milestones. Entrustable Professional Activities, or ‘EPAs’, are activities that will ultimately be entrusted to you to carry out during your residency program. They are the overall clinical tasks that must be accomplished. A series of EPAs have been developed for each stage of residency and once you can demonstrate that you’ve gained sufficient competence to successfully complete these tasks, you’ll be promoted to the next level. Milestones are meaningful markers of progression. They reflect the abilities you need to accomplish a specific task, and many milestones are integrated into each EPA. Milestones have been developed to help teach and prepare residents to achieve the EPA. To illustrate how these concepts are used, it’s helpful to look at a common clinical responsibility. As a physician, you’ll have to be able to discuss serious news with your patients and their families across many different clinical environments. This is an example of an EPA. It’s a task that you must be able to perform and you’ll be assessed on whether or not you’re able to competently do so. The milestones help you get there. Milestones link directly to the CanMEDS framework and in the example above, being an effective communicator is especially important. You’ll have to relate to the patient in a way that honours their unique needs; you’ll need to facilitate discussions that are respectful, non-judgmental, and culturally safe; and complex information about the diagnosis and plan of care must be communicated in a clear, compassionate, respectful, and accurate manner. The shift to a competency-based system at Queen’s, and indeed across the rest of Canada, is being undertaken primarily for one reason. It will help the next generation of learners become better physicians. Specifically, a competency-based curriculum will provide a better educational experience to residents in many different ways. All residents will receive more supervision, assessment, and mentorship from faculty supervisors and dedicated academic advisors, who will ensure that competencies are being met for each stage. Residents and their advisors will have the opportunity to identify areas of strengths and weaknesses at regular intervals and be able to develop individualized learning plans. Residents who have been able to demonstrate competency at an accelerated pace may pursue additional opportunities for enrichment. Instead of finishing their program earlier than others, these residents will have more time available in areas such as electives and research. A new assessment system has been designed specifically at Queen’s for our residents. It features personalized electronic portfolios, competency-based assessment tools, and increased frequency of assessment by physicians, allied health professionals, and patients. Residents will be assessed more frequently and in many instances in real time by utilizing mobile technology. 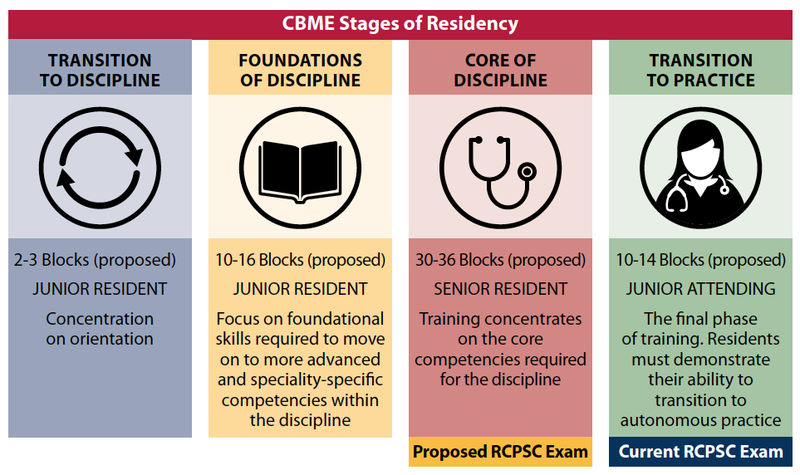 It is anticipated that residents will sit their RCPSC examinations six months to one year earlier than usual, allowing them greater time in the final phase of their program to work more independently in preparation for practice.